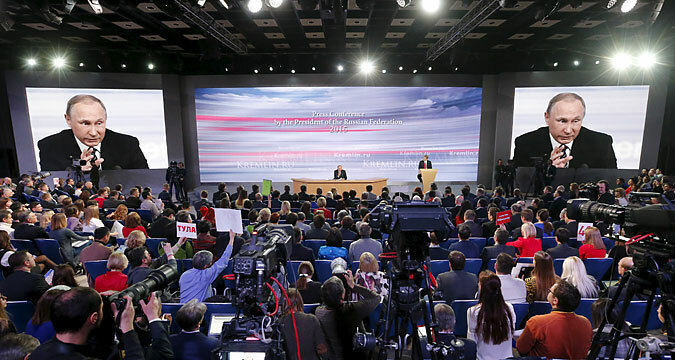 Journalists listen to Russian President Vladimir Putin during his annual end-of-year news conference in Moscow, Russia, December 17, 2015. Russian President Vladimir Putin held his annual end of year press conference Thursday at which, for over three hours, he fielded questions on everything from the economy to Russia’s relations with Turkey, to the birth of the “Islamic State” [a banned organization in Russia], Ukraine and the Nobel Peace Prize for FIFA President Joseph Blatter. “Earlier forecasts about coming out from the crisis were based on the assumption that a barrel of oil would cost $100. ... However, the worst of the economic crisis, even at the current price of oil, is behind us. The peak of the crisis, but not the economic crisis itself. Despite all the difficulties, Russia fully complies with all its obligations to international lending institutions. “With the current Turkish leadership, for us it is difficult, and virtually impossible, to negotiate. When we say that we agree, then they stab us in the side or in the back. I do not see any opportunity to establish good relations with Turkey at the government level. If someone in the Turkish leadership has decided to lick the Americans in a certain place, I do not know, was this the right way to do it, do the Americans need this. The actions of the Turkish authorities; this was not an unfriendly act, but a hostile one. … What, was it difficult to pick up the phone, or use communication channels, and make a call? No one said anything. And what did they achieve? Did they think that we would run away? Russia is not such a country. We increased our military presence – the S-400s are there now. If earlier Turkey was constantly flying and violating Syrian airspace, now let them fly there. It was necessary to bring in cannon fodder under Islamic slogans, which are actually protecting economic interests. That is how ISIS was born. This is how I look at all this: it seems to me, ISIS; this is already a peripheral thing. At one time, they went into Iraq, destroyed the country, was this a good thing, bad thing? No matter. We do not think that this coalition [recently established under the auspices of the Saudis, a regional, anti-terrorist coalition in the Middle East] will be of an anti-Russian character. <...> We have a different approach to resolving the crisis in Syria, but there are also common points of view. We sought to maintain economic relations with Ukraine. However, Ukraine, operating in a unidirectional mode, left this regime and joined the EU. This is not the way to do things. <...> Ukraine will not enjoy privileges and preferences in its trade with Russia. However, this is not our choice. We tried hard. We are not going to introduce any sanction with respect to Ukraine; I want people to clearly understand this. We will just switch to the most-favored-nation trading regimen. First of all, we have never said that there are no people involved in military issues there. However, this does not mean that there are regular troops. Do you see the difference? Secondly, the exchange [of Ukrainian soldiers] should be equal. We need to liberate people who are being held, from the one side, and from the other. It is no secret that the Ukrainian authorities consider those whom they had detained in the Donbass, should be exchanged. Those arrested in Kiev and sitting in prisons, they leave out of the equation. We are obliged to take action. If we talk about the children of the Prosecutor General, we need to understand whether they had violated the law. Is there, in the work of the Prosecutor General, any element associated with a conflict of interest? It is necessary to take a closer look, including clearing up the information appearing on the Internet. Among the outcomes [of my 15-year rule of the country] are, a significant increase in the incomes of the population, GDP growth, a strengthened national defence system and fight against terrorism. And such things of this character [scandals around the Prosecutor General, a governor’s involvement in the beatings of journalists, and so on] are found practically everywhere. No country has the right to extend its jurisdiction to other states. We need to fight corruption. However, this practice of grabbing foreigners here and there, and dragging them into an inquiry – is unacceptable. Is there corruption in FIFA? The investigation will determine this. Blatter is respectable man, and he did a lot for the development of world football. His contributions in the humanitarian sphere in the world are colossal. <...> This is a person that should be given the Nobel Peace Prize. Let us wait for the end of the investigation, and see who is to blame there. We are against all forms of doping. It destroys people’s health. It is poison. If anyone has used banned drugs, he must be appropriately punished.